Irvine, California: Kherem La Yah Press, 1984. Book. Very Good. Stiff Wraps. First Edition. 4to -- 10 in Tall. 136 pp. with photos, drawings, bibliography, reference notes, linguistic charts. Fading of grey cover along spine. No spine creasing, no markings. Light wear. An errata sheet laid in. In this monograph written for laymen, Deal lays out his theory that ancient Hebrew mariners visited North America perhaps 3,000 years ago. He asserts that inscriptions found on a cliff in Valencia County, New Mexico, are a form of ancient Hebrew and proclaim the Ten Commandments. Several appendices discuss linguistic connections between Shemetic (Semitic) language and Toltec, Aztec and Maya languages. Deal is a theorist in diffusionism, refuting the idea that America was settled mainly by Eurasians crossing a Siberian land bridge. He also has done research on possible archaeological traces of Noah's Ark..
Peking, China: Foreign Language Press, 1978. Book. Very Good. Trade Paperback. First Edition. 12mo -- 7.25 in Tall. 128 pp., with 8 pp. of color photos, additional b&w photos. Clean, light wear, no markings. Light soil on rear cover. A collection of 16 articles from various Chinese archaeologists and publications re archaeological work inside China during the 1970s. Quotes from Chairman Mao sprinkled throughout. Includes a summary of finds, plus details about Panlunghcheng, a Shang city; tombs f the early western Chou dynasty; a mining site in Hupeh province; Chu's tomb in Kiangling; Chin pottery unearthed in Kirin; an overview of the art of the early Chin Dynasty; silk books from Tomb 3 at Mawangtui; military treatises recovered from the Han Tombs. a Li Ping statue; mural paintings from the Wei and Tsin tombs at Chiayukuan; galleries of Tang Dynasty murals; relics found on the Hshish Islands, and more..
NY: E.P. Dutton & Co, 1977. Book. Very Good. Leatherette. 4to - over 9¾" - 12" tall. 264 pp., 240 illustrations, photos and maps, 100 in color. Fine except for 1 by 2 inch upper right corner ripped away from front free endpaper. No markings, binding solid. 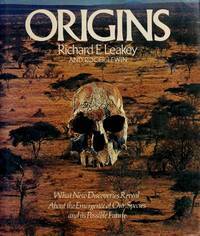 The son of Louis and Richard Leakey theorizes that 3 different species of hominids lived in the same era in prehistoric Africa. He argues that humans are distinguished from apes by their ability to share and construct a culture. Readable distilliation of archaelogical issues of human evolution..
NY: Alfred A. Knopf, 1953. Book. Very Good +. Cloth. 13th Printing. 8vo - over 7¾" - 9¾" tall. 428 pp. Very clean and sturdy, light wear, no markings except for tiny ink date on front endpaper, and previous owner's embossed ID seal on front endpaper and flyleaf. With 32 plates, bibliography and index. An introduction to archaelogy for the layman; a highly readable explanation of what archaelogy is all about and brief descriptions of some of its major figures..
NY: Dell, 1973. Book. Very Good. Mass Market Paperback. First Paperback Edition. 12mo - 7 in. Tall. 225 pp., light to moderate toning. No spine creases or markings, a few pages have dog-ear creases. With b&w photos and illustrations. Green-tinted edges. An unorthodox survey of various archaelogical sites and what they hint at in terms of extraterrestial visits, etc..
NY: Alfred A. Knopf, 1994. Book. Very Good. Cloth. 292 pp. with b&w photos, illustrations. Bibliog., notes, index. British archaeologist-anthropologist applies radiocarbon dating to conclude that European prehistoric cultures predate Pyramids. Size: 8vo - over 7¾" - 9¾" tall. NY: Simon & Schuster, 1997. Book. Very Good. Boards. 233 pp. Inscription on front endpaper, otherwise no markings. Faint outline of a coffee spot on rear panel of dust jacket, slight chipping. A Biblical code discovered by Israeli mathemetician Eliyahu Rips and his colleagues in 1994 is presented in layman's terms by an investigative reporter. 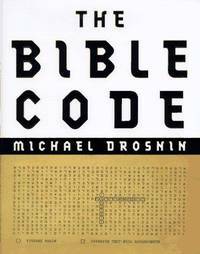 The code is a series of Hebrew words that can be found in the first 5 books of the Old Testament. Drosnin said he became a believer in the code after he warned Yitzhak Rabin of a foretold assassination a year before Rabin's murder occurred. An appendix gives the text of the 1994 Statistical Science paper that presented the code hypothesis to the scientific community. Size: 8vo - over 7¾" - 9¾" tall.